Frankly, I was pretty shocked to have been diagnosed with early-onset Parkinson’s Disease about a week before my 42nd birthday—me, a mom of 2 boys, 14 and 11. That was two years ago, and now I think the most surprising thing is how “normal” my life is under the circumstances. I’ve been married for 19 years, and I run marketing at a high tech startup in Santa Clara. I happily spend my weekends at soccer games, football games, basketball games, and tennis matches. I live in San Jose. I’ve been brewing beer in my kitchen for 15 years. Not the same batch. 😉 I’ve lost 40 pounds in the past two years (yay!). Granted, I pop pills every few hours to control my symptoms, but if you didn’t know me—if you just met me in a meeting at the office or stood next to me in line at Starbucks—you probably would have no idea that I have this serious degenerative neurological condition. I would like to keep it that way. I’m walking in Moving Day to heighten awareness and help raise funds for advanced research. I’m walking to beat Parkinson’s. I will be joined by other strong, beautiful, resilient women who are part of our Parkinson’s Women Support group in the Bay Area. Please consider supporting our team with a donation…I would be extremely grateful. 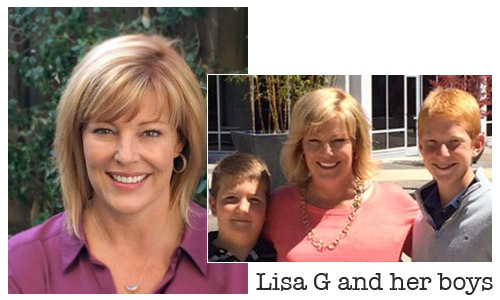 What a doll Lisa G. is! Have you noticed extra cool people are the ones with PD?!! 😉 I’m truly enjoying reading about all these amazing woman! By far one of my favorite people that inhabit this earth. I love you Lisa! Thank you for sharing your story, and know that we are on your team. You go Girl! Thank you for sharing your story – an encouragement to anyone that struggles with a medical condition. Never ever give up a cure could be found tomorrow!